This post is adapted from the authors’ paper Australian defence: challenges for the new government , published in the latest edition of Security Challenges. There’s a set of enduring policy principles that have guided the defence policies of both sides of Australian politics, and defence policy in Australia is effectively bipartisan. So we shouldn’t expect any surprises as the new Coalition Government comes to terms with the challenge of reducing the gap between the cost of Australia’s strategic ambitions and the funds available to achieve them. Given the size of this gap, and the prospect of enduring austerity in the defence budget, this challenge will prove formidable. We’ve developed some policy principles to see how they might best be applied in contemporary circumstances. We think that the policy focus on the defence of Australia and operations in our immediate region continues to be inviolable, especially with the expected continued growth of the economies and military potential of the major and middle powers of the Indo-Pacific. We’ve also re-emphasised the centrality of a strategy that is maritime in focus. But the nature of the imbalance between the costs of the ambition set out in the 2009 and 2013 Defence White Papers of the previous Labor Government and likely funding levels means that there are no easy solutions to the challenge of restoring the balance. Essentially, there’ll have to be reductions both to the preparedness (and therefore potentially also to the size) of the force in being and to the modernisation program. In judging the best balance implied by this choice between the present and the future, it’s important that expediency not cause undue weight to be given to preserving the force in being at the expense of the future force. 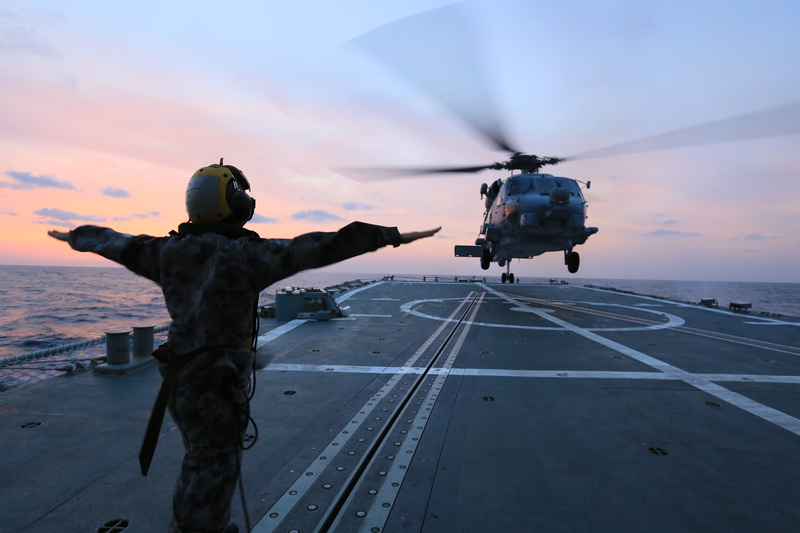 Australia’s strategic circumstances are relatively benign at present but the longer term future, on which the more critical and costly parts of the modernisation program are focused, is likely to prove much more demanding. It won’t be easy to cut costs or to redirect money to investment in the future force. The proportion of the defence budget that is now spent on investment has fallen to 22%, when historically it has been about 33%. Personnel costs have risen dramatically and now account for 42% of defence spending. One option is to cut defence personnel numbers to find the additional $2.85 billion a year necessary to bring the investment share of the budget back up to 33%—and even that mightn’t be enough for the modernisation program currently envisaged. Even if the civilian defence workforce were cut by half (some 10,000), it would save only about $1.1 billion annually and still leave a shortfall of $1.8 billion in the historic share of capital investment. This would imply that cuts to the Defence Force, whose per capita costs are some 30% higher than civilians, would also need to be made. To reduce ADF personnel costs by $1.8 billion would require ADF numbers to fall by some 12,500, or about 20 per cent of the ADF target strength of 59,000 full-time personnel. Another possibility is to look at some of the big ticket items and decide whether they need to go ahead as currently planned. And the biggest is the future submarine. It will be important for the new government to revisit why the 2009 Defence White Paper decided to double the number of submarines from six to twelve. For the last 45 years—including in the Cold War when Australia’s Oberon class submarines operated against the Soviet Navy—we’ve never had more than six. This doesn’t mean that there isn’t strategic justification for twelve submarines, but the case is yet to be made publically. Likewise, the acquisition of F-35 Joint Strike Fighters might usefully be reviewed, at least until there’s clarification about the technological faults and delays involved and the likely final costs. These observations require that renewed attention be given in defence planning to using the ideas of warning time, the core force, preparedness and the expansion base, and to acknowledging the need to identify and manage strategic risk. They imply that force elements which can be expanded relatively quickly should now be reduced, especially with the pending draw-down from Afghanistan. They imply that those force elements which have long lead-times and which are critical to a maritime strategy should continue to receive priority, although even here there could well be scope in the shorter term to go to lower levels of preparedness, at least selectively. Giving priority to modernisation, however, doesn’t imply that there’s no scope to review the modernisation program. In particular, the future submarine and the JSF are both central to a successful maritime strategy, but we’ve argued that they should both come under scrutiny. But modernisation proposals for the Army are in a different category. In brief, the government should instruct the Army to abandon its preoccupation with planning for fighting a ‘peer competitor’ and to focus instead on more credible contingencies involving the defence of Australia and our nearer maritime region, including Southeast Asia. Importantly, the process of reviewing preparedness and modernisation should lead to a clear understanding of any additional strategic risks being run—that is, the risk that Australia’s ability to respond to a contingency wouldn’t be timely or strong enough. Such analysis would of course need to differentiate between those contingencies to which Australia would be obliged to respond and those for which a response would be discretionary. It’d provide a solid basis for discussions with other areas of government concerning levels of defence funding—and a far more substantive argument than assertions based only on percentages of GDP. For our part, were the funding situation to prove less dire than we’ve anticipated, we’d advocate a strong preference for maritime capabilities and their modernisation. This isn’t to say that the Army should be ignored but, rather, in the hard world of decision-making on resource allocation, our priorities have to reflect the enduring reality of Australia’s strategic geography. Paul Dibb is Emeritus Professor of strategic studies at The Australian National University. Richard Brabin-Smith is a visiting fellow at the Strategic and Defence Studies Centre at the Australian National University. Image courtesy of the Department of Defence .